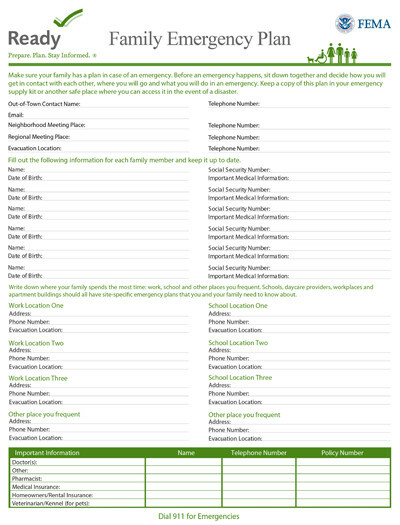 Prepare your family’s Emergency Plan Sheet. Get the kids involved in preparing your family’s emergency plan—download a Family Emergency Plan information for kids. Hawaii is susceptible to many types of natural disasters, and it’s important to be ready. Though it’s impossible to plan for every emergency, there are a few essentials that you will need in order to be prepared for unexpected events. First, consider that your family may not be together when disaster strikes. It is important to plan in advance by figuring out how you will contact one another, how you will get back together if you are separated, and what you will do in different situations. To help, the U.S. Centers for Disease Control and Prevention (CDC) and the American Red Cross have teamed up to answer common questions and provide step-by-step guidance you can take now to protect yourself and your loved ones. Hawaii, Are YOU Ready? Make a Plan.